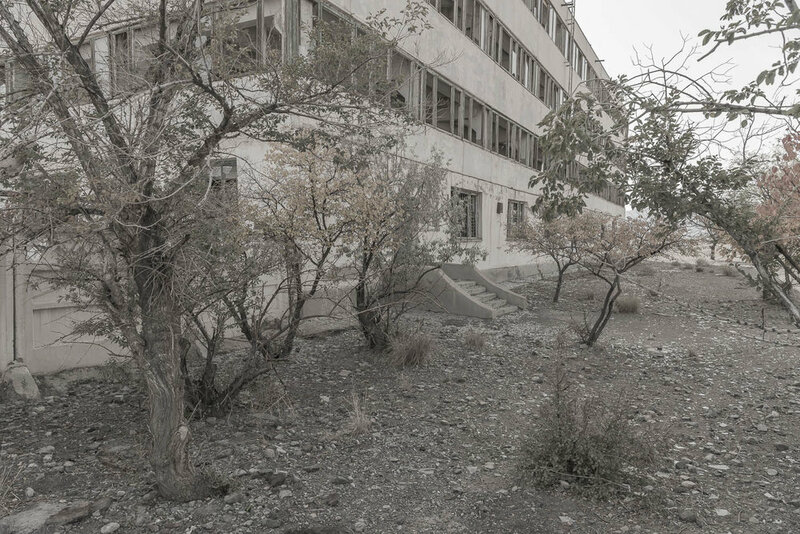 More than a quarter of a century after the break up of the USSR, Balykchi, once one of Kyrgyzstan's industrial powerhouses, situated on the banks of a giant Alpine lake, is a Soviet ghost town. Today it represents a symbol of communist decay. Hulls of ships and cranes rust at the port and factories lie in ruins; parks that were once the pride of the city are filled with weeds and statues of Lenin crumble. 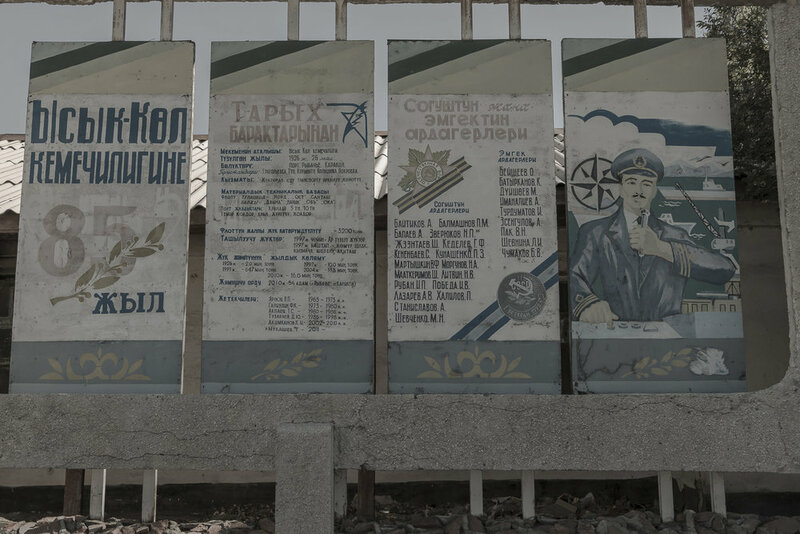 Balykchy, which means "fisherman" in the Kyrgyz language due to the city's fishing and boatbuilding heritage, was devastated by the break up of the Soviet Union which brought and end to trade links and financial backing from Moscow. As factories dwindled to a halt people lost their jobs and the town eventually went from full employment to almost nothing. Today there's a few private restaurants and shops that serve tourists travelling to the resorts that lie further east along Lake Issyk-Kul, the world's second biggest Alpine lake. People set up stalls selling fruit and dried fish to motorists. But the fish comes from China and not the lake which doesn't contain much fish these days. There’s also a brisk trade to be done at the town market selling goods imported from China. 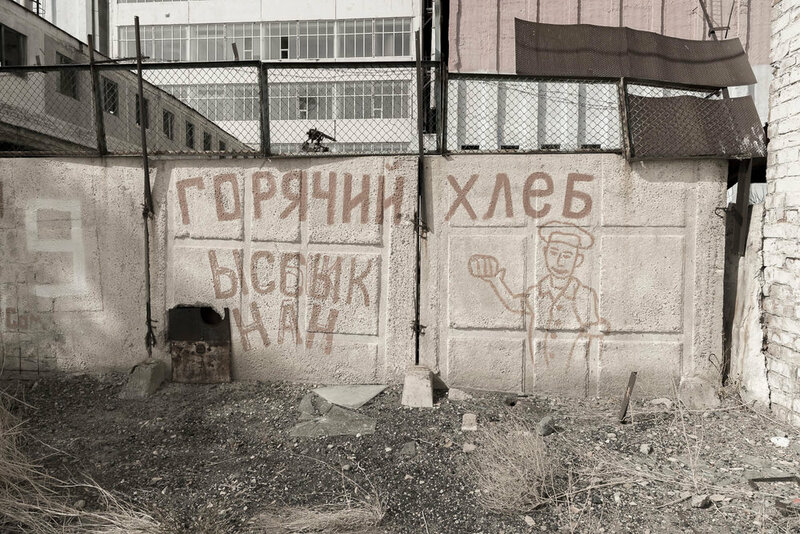 But many young people are forced to leave their country and find work in Russia and Kazakstan, often leaving their children with their ageing parents. 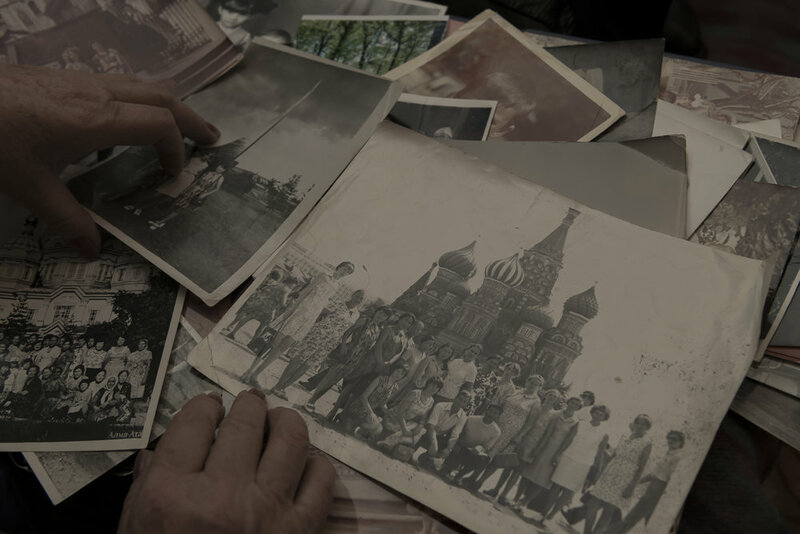 These pensioners continue to cling to communist ideals and dream of Soviet times when food and housing was cheap and they could afford to travel to Moscow and Kiev. They struggle to survive on meagre pensions and are forced to look after their grandchildren 24/7. Valentina Palamar, 63, lives in a dilapidated Soviet-era apartment block. The balconies look so precarious that they might fall off and the crumbling stairwells are dark and eerie, even in the daytime. Valentina's one-room flat is next to her daughter's which is convenient as it means she can help look after her 3 grandchildren. Her daughter is divorced and works as a primary school teacher and earns only $50 a month so Valentina also contributes some of her $100 pension from her years working as a nurse. The flats have no heating or running hot water so it's bitterly cold in winter. But Valentina takes me to the balcony to show me the view of the lake and the mountains. "We don't have it so bad," she says, "and I have my health." 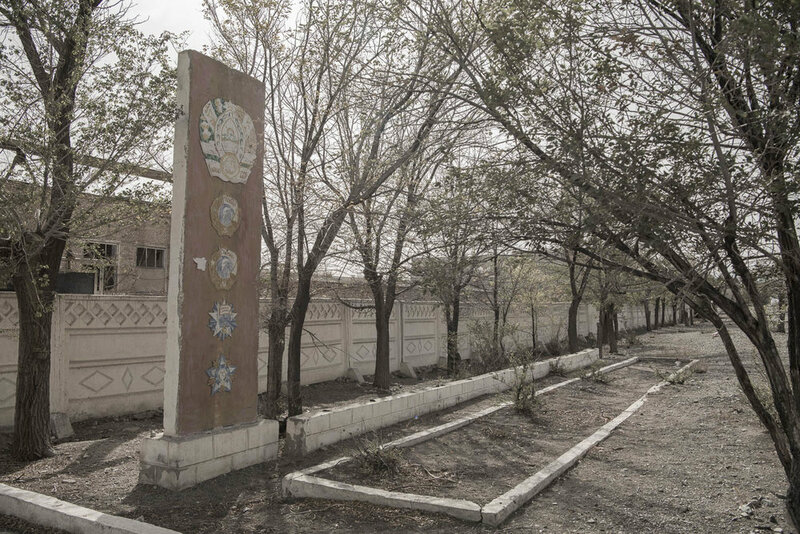 Still, life was better during Soviet times, she says showing me holiday photos of trips to Kiev and Tashkent. "In those days we could afford to travel. I even went to Bulgaria with the young communists." Olga Ogarkova, 61, lives with her husband Oleg in a pretty mud-walled bungalow more reminiscent of Russian tsarist times than Soviet. In the ramshackle garden are wooden racks of apricots and slices of apples drying in the sun. Olga points to her fruit trees and tomato plants. She also keeps hens which give them plenty of eggs. Her husband has diabetes so most of their $100 a month pension goes on prescription drugs. "During Soviet times life was good," said Olga. "We all had jobs and a reason to get up in the morning. 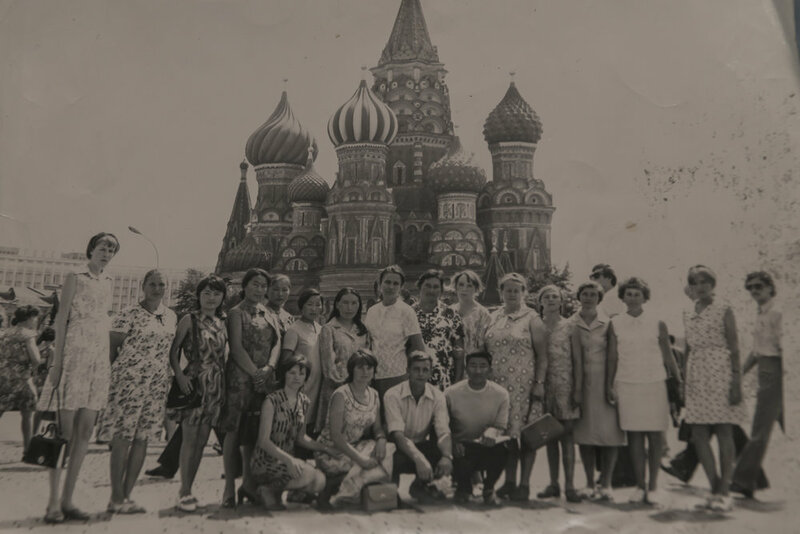 We could travel to Moscow, Uzbekistan and Kazakhstan", she said showing me photos of her travels and May Day marches during the Brezhnev era. "My husband even went to Germany. "Now young people just hang around and drink vodka there's nothing for them to do." Valentina Pogojeva has acted as a full time mother to her two grandchildren Dasha and Lena since they were both 10 months old. Her daughter Nadejda Mahortova works for an engineering company in Almaty, Kazakhstan. The girls have different fathers and neither keeps in touch, which is all too common in Kyrgyzstan these days. Their mother returns home for 3 days each month. "She comes laden with presents and plays with them," explained Valentina. "But to know your children you have to see them every day." Sometimes the Dasha and Lena call Valentina mummy and other times granny. She gets them ready for school, cooks their meals and helps with homework. Valentina says the school has offered to help but she says there are more deserving cases. She says they manage okay with her daughter's income and by keeping chickens and growing vegetables in her small garden. In the summer holidays one of the churches paid for the girls to attend a camp which gave Valentina a well earned rest. "You can always tell the children who don't live with their parents," she explained:	"They watch other pupils being picked up by their parents and you can see the sadness in their eyes. Many also have behavioural problems as their granparents can't always control them." 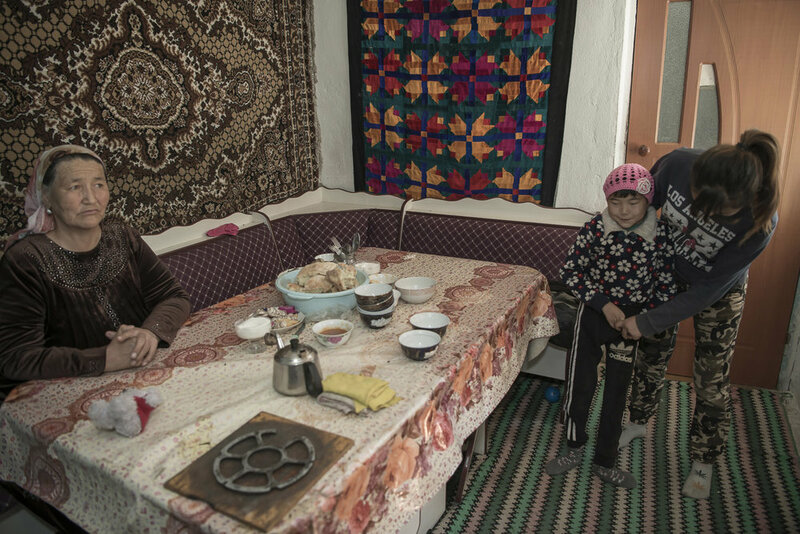 In a crumbling white-washed mud bungalow on the outskirts of Balykchi, 6-year-old Adinai is propped up at the kitchen table beside her two sisters Aklai, 15, and Ryana, 12 and their grandmother Samira Omuralieva. Flies buzz around a plate of dried bread and a pile of chicken bones left over from lunch. 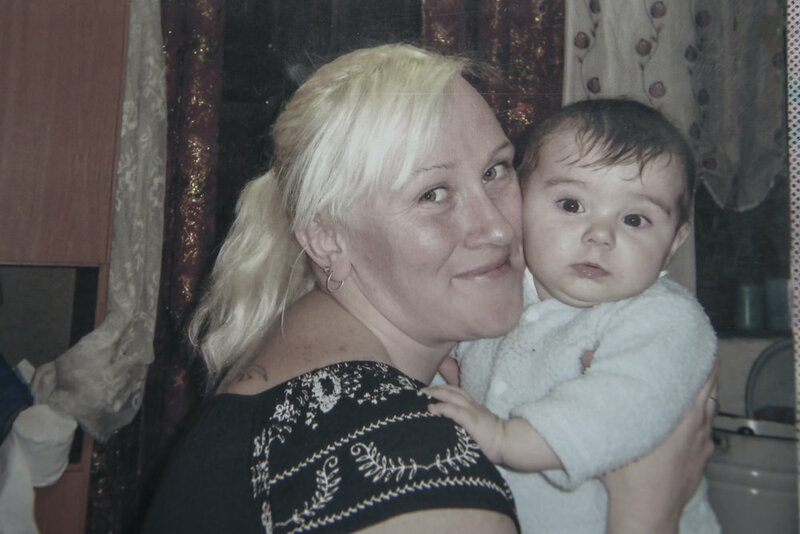 Adinai was born with brain damage and needs regular physiotherapy which is why the girls' mother Diana, who is divorced, has been forced to work in Turkey as a nanny to pay the medical bills. The girls' father isn't around so Samira and the two older girls take care of Adinai. "Money is very tight but what can we do," says Samira.